“GMO” stands for Genetically Modified Organism, which is a plant or animal that has been changed on a genetic level. Non-GMO means the organism is not genetically modified, leaving it the way nature intended. We share your concern about rising GMO use in food and agricultural products. That’s why we worked with the Non-GMO Project to develop the first standards and verification for Non-GMO Project Verified Eggs. Now, not only can you feel good about the fact that your NestFresh Eggs come from humanely treated hens, but you can also take pride in helping us reduce the number of GMO crops used to produce egg products across the country. We are proud to be the first egg company to produce Non-GMO Project verified eggs. NestFresh hopes to make similar progressive changes to our industry as we continue our leadership in humane, sustainable farming. Most developed nations do not consider GMOs to be safe. In more than 60 countries around the world, including Australia, Japan, the United Kingdom, and all countries within the European Union, there are significant restrictions or outright bans on the production and sale of GMOs. According to the Non-GMO Project, 80% of conventional processed food contains GMOs, so choosing non-GMO products has an important impact on families, farmers, and the Earth. 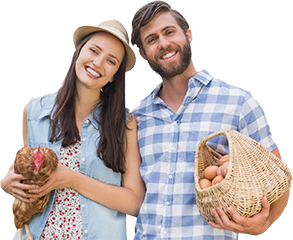 When you buy NestFresh Non-GMO Free-Range Eggs, you are helping to protect us all from food safety and environmental issues including increased pesticide use, unknown changes in biodiversity, violations of farmers’ rights and threats to food security. Are there GMO Chickens or Eggs? While chickens themselves are not genetically modified, most chickens in North America are raised on a combination of corn, alfalfa, soy, and canola. All of these crops are very likely to come from GMOs. The majority of genetically engineered crop acres in the United States are used for animal feed and the Non-GMO Project seal requires the ongoing GMO testing of feed at the farms. Avoiding products from animals raised on GMO feed is a way to reduce GMO use and contamination. Our farms support over 7,500 acres of non-GMO crops to feed our hens that would otherwise be used to grow GMO corn and soy. Learn more at The Non-GMO Project website. 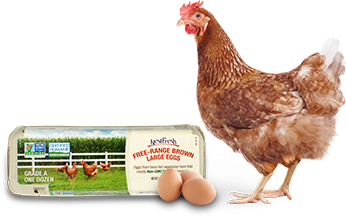 NestFresh is also the proud producer of Nature Fed Eggs, which are Non-GMO Project Verified.